Sometimes there is such thing as serendipity. When Jake Solomon was in high school, he spent all of senior year playing X-COM, a classic sci-fi game series that is part turn-based grid battle, part strategic simulator. He loved the experience so much, he went into computer science so he could make games just like it. 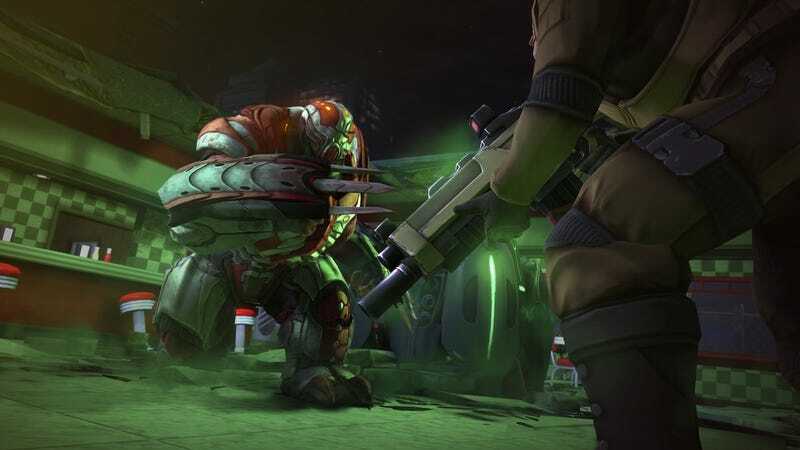 Now he's the lead designer of XCOM: Enemy Unknown, a reboot of the series that had been presumed dead for the past decade until publisher 2K Games announced it was working on not one, but two games in the beloved franchise. And Solomon gets to live out his childhood fantasy—all thanks to a little bit of begging. "Ever since I've been at [development studio] Firaxis, I have said please please let's make XCOM please please," Solomon told me at an interview in New York City last week. "Every time it comes up, I've said 'OK, can we do XCOM now? Can we do XCOM now?'" The big bosses must have grown sick of him asking, Solomon joked. Four years ago, they finally gave him the green light to work on the project, which he says the team wouldn't have been able to make without the modern technology. "They said, 'Well what is in XCOM?' and I said they've gotta have X, Y, and Z," Solomon said, explaining that it just wouldn't be an XCOM game without features like destructible environments. "When we looked at the Unreal Engine and when we realized we could do that game with it, we said to [publisher 2K Games] you know this is something that makes sense for Firaxis." Solomon casually refers to himself as "Sid Meier's lieutenant." He has worked directly under the legendary Civilization creator for the past 12 years, helping the team ship strategy games like Civilization IV and Pirates!. So when he pitched the folks at 2K and label owner Take-Two Interactive, it wasn't tough to get them to see things his way. "It wasn't a hard sell at all," Solomon said. "They said they're kinda excited about the idea that there's nothing like it out there." There's nothing like it out there. That's a line you'll hear in a metric ton of development diaries and marketing videos, but in the case of XCOM, it's kind of true. Lots of games have real-time or turn-based strategy elements, but very few blend them like XCOM does. And very few have elements like layered destructible environments—the type you can break apart, piece by piece, like you'll be able to do in XCOM: Enemy Unknown. I asked Solomon why he thinks nobody has emulated that formula. "Because four years later, I wanna throw myself out a window," he said, laughing. "No—because it is a really, really— I've been upfront in saying it has been a really challenging game to develop. That first [X-COM] was done in 2D, and a lot of those concepts in 2D are a piece of cake. You transition to 3D the way the industry did, and they become very difficult." He cites destructible environments, fog of war, and line of sight as some of the mechanics that gave the team the most trouble. But he says he's too obsessed with the original game to not implement all of those features. We'll have more on XCOM: Enemy Unknown later today.